James stated he was a 38 year old farmer of Gilgandra when he enlisted on October 8, 1915 at Gilgandra. Later his sister stated he was 48 years old. He was 5’ 5 and 1/2”; 11stone 7lbs (73kgs); fair hair and fair complexion with blue grey eyes. James had an oval scar on his left shoulder. He had no previous military service. He marched to Sydney with the famous Cooee March and after training in Liverpool for 3 months, he embarked for Egypt on the ‘Star of England’ on March 8, 1916, arriving on April 11 1916. After further training in Egypt, James sailed for Marseilles with the 13th Battalion, arriving June 14, 1916. He experienced the first major battle with the 13th Battalion at Pozieres in August. 1916. The battalion was being relieved in the vicinity of Mouquet Farm when he received a gunshot wound to the back. 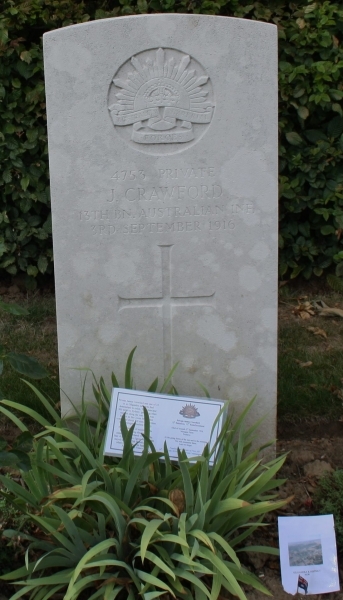 James was evacuated to the 49th Casualty Clearing Station where he died of his wounds on the September 3, 1916. He was buried at Contay British Cemetery. His mother lived Hillhead, Castle Fern, Donegal, Ireland and his effects were returned to her there. They included 3 brushes, collar, stud and comb, plus 2 discs, metal chain, 2 keys, wallet, pocket book, photo, company colours, religious medallions, testament, hankies, note book, clasp knife, knife, lanyard, corkscrew and letters. His mother believed there may have been possessions remaining in Gilgandra and Elizabeth wrote to the Army Base requesting his address in Gilgandra. An advertisement was placed in the Gilgandra Weekly in 1917 asking for information. It is unknown if there were any replies. A Memorial Plaque (dead man’s penny), the Victory Medal and the British War Medal were sent to his mother. He is commemorated on the Australian War Memorial Wall of Honour on Panel 68, the Cooee March Memorial Gateway in Gilgandra and the Gilgandra & District Honor Roll in the Visitors Centre, Gilgandra NSW.